Note from dshort: This commentary has been revised to include today's release of Industrial Production and yesterday's Retail Sales adjusted with today's release of the Consumer Price Index. The weight of these four in the decision process is sufficient rationale for the St. Louis FRED repository to feature a chart four-pack of these indicators along with the statement that "the charts plot four main economic indicators tracked by the NBER dating committee." This morning I've added two more of the Big Four for November: Industrial Production from the Federal Reserve, the purple line in the chart below and Real Retail Sales, the green line. For a detailed overview of the latest Retail Sales, see my latest update, which I've revised to include today's release of the November CPI. 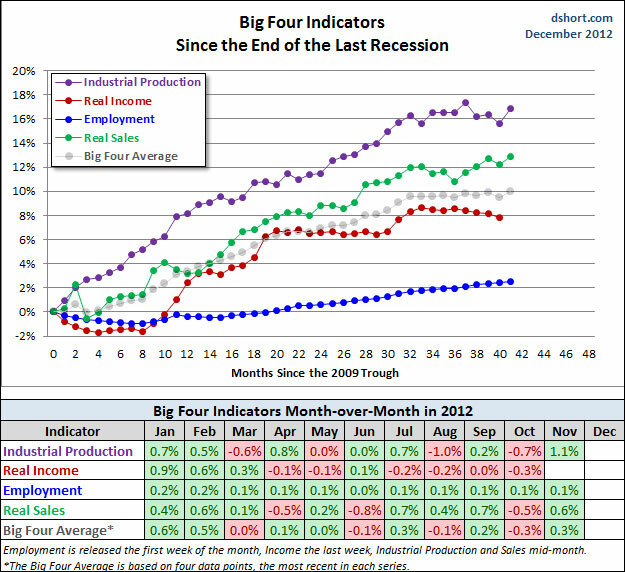 At this point, the average of the Big Four (the gray line in the chart above) shows us that economic expansion since the last recession had been hovering around a flat line for the past several months. 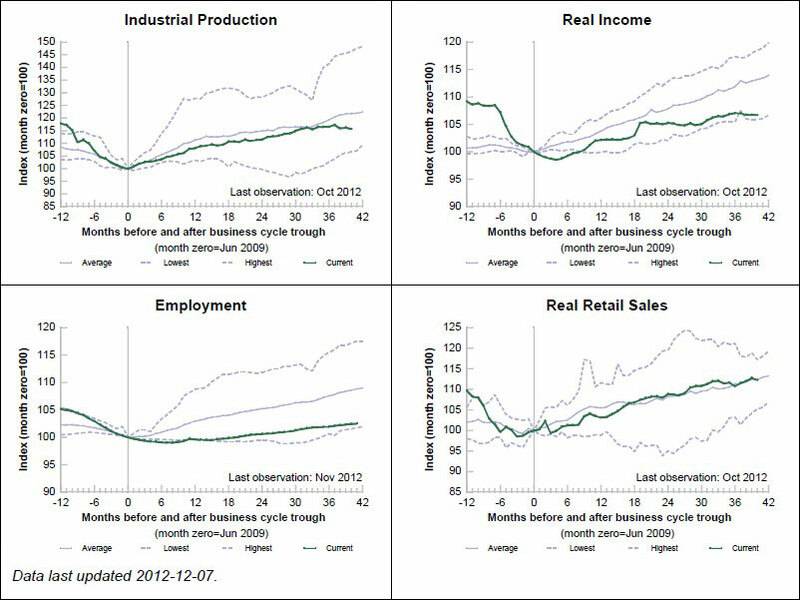 But the November data for Employment, Industrial Production and Real Retail Sales have shown improvement. As for the recent data, of course they are subject to revision, so we must view these numbers accordingly. The behavior of all four of these indicators will be critical as move from the fourth quarter to the new year. Superstorm Sandy has not been traumatic to the economy, and we will see some positive effects from rebuilding in the impacted areas. Holiday season sales will be something to watch in the next Retail Sales release. On the negative side, the continuing weakness in Real Personal Income Less Transfer Payments is a looming threat, and we may see evidence of it in the final tally of holiday spending. Finally, of course, the outcome of Fiscal Cliff negotiations remains a near-term worrisome wild card in the economic hand.